Graduation talk delivered by Francis Chare t, IMA faculty and coordinator of Consciousness Studies, at the Individualized MA graduation ceremony on Feb. 14, 2010. Ladies and gentlemen, members of the Goddard community, families and friends. I am honored to have been invited to say a few words at this commencement. When I received the email from Jaes asking me, on behalf of the graduates, to be the commencement speaker I was sitting at my desk at home in Montreal. I began to remember my own graduate studies and all the things I was interested in and pursued, my ambitions, hopes and dreams and what I had attained in the years in which I studied. As I thought about all of this, I looked up over my computer and starred as I often do at a wooden image that sits on a shelf. 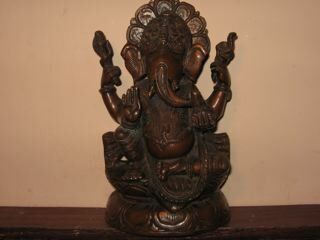 It is a small statue of the Indian deity and mythological elephant headed figure, Ganesha. It found its way there, like other objects I have accumulated, because of my interest in the cultures and religions of the planet and of India in particular. In fact, it was really my encounter with Indian culture that first awakened in me a sense of the largeness of the world, how small and western I was, and how much we all have to learn from each other and yet we often miss the opportunity to do so. As I thought about all of this it occurred to me that the figure of Ganesha represents a combination of the things that might be of value to try to briefly speak about to our graduates. Lost in work and other things I thought I would pick up on these ideas sometime later. As fate would have it, when I arrived at Goddard with as yet not entirely worked out thoughts, I ran into Sowbel, acting director of the HAS program, who said she wanted to show me something. This turned out to be this statue of Ganesha sitting on a figure with three elephant heads. Bemused, I took this as a sign that, indeed, my brief talk should be about the qualities that Ganesha embodies and clearly, to fit the symbolism of the three heads, there had to be three of them namely strength, wisdom, and responsibility, all qualities that are attributed to Ganesha. Now Ganesha is one of those remarkable combinations of human and non human elements that India has characteristically produced in great abundance, flourish and wonderful variation. He has a human body, usually with a nice rounded and very full pot belly, and his torso is crowned with an oversized elephant head. In the earlier fateful encounter of East and West, he ran afoul of the colonizing Europeans and their aesthetic ideals and entered the list of what one contemporary historian of Indian art has called “much maligned monsters”. Yet, since medieval times, Ganesha has attained an audience in India that surpasses them all. This elephant headed figure is found in greater numbers in statue, relief, painting and poster form than the rest. There are now monographs written on this figure and various stories to explain his emergence and I won’t detain us by looking at these as interesting and entertaining as they might be. Instead, I simply want to acknowledge that this figure has become an object of interest and popularity and now even migrated to the west and it might also have something to say to us and to our graduates in particular. In order to do this I would like to focus on the three things that I mentioned, namely strength, wisdom and responsibility. Let me add that one of the interesting parallels between the figure of Ganesha and Goddard is that we, like the figure, combine together things that often are not combined elsewhere and in that sense we, too, are unusual and maybe even a bit exotic. In Indian myth and culture Ganesha is an archetypal auspicious figure who is known by his chief attributes as the remover of obstacles, patron of scholars and protector of the community. Obstacles Ganesha, the great and powerful elephant headed god, is often displayed as using his strength to move seemingly immovable objects and does so with considerable determination and patience. He is especially venerated for this attribute for the obvious reason that life is chock full of obstacles, big ones and small ones, some easily overcome others not. 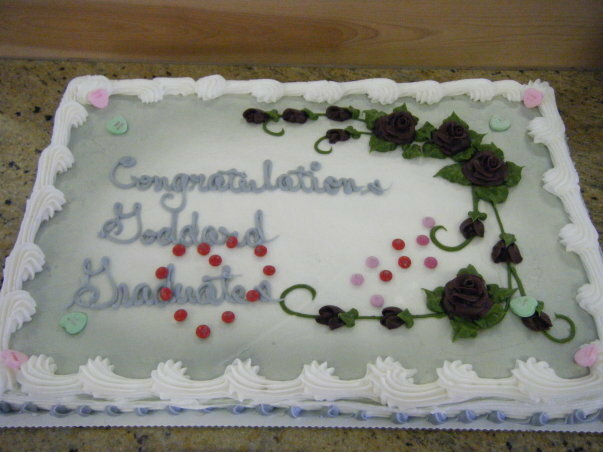 Graduates, I know that all of you have faced such obstacles in your lives but here, at Goddard, we also know that not infrequently, the greatest obstacles are those we ourselves have created. Getting out of our own way is a challenge and requires similar resources such as strength of character, determination of will, patience and kindness. Learning this has been an important part of your experience here at Goddard. Knowledge Ganesha is the patron of scholars. This attribute implies that knowledge is one of the most desired and vital resources in order to understand, move through the world and make it a better place. Graduates, you have all acquired considerable knowledge in a variety of subjects and disciplines but I would venture that the most important acquisition has been knowledge of yourselves, who you are, what interests you, and what you want to take out into the world. This, too, has been an important part of your experience at Goddard. Responsibility Ganesha is the lord of hosts and protector of the community. Knowledge of the world and oneself is both a valuable accomplishment and an indication of success that is commendable and is a shared goal of many educational institutions. Yet at Goddard you have learned something more and that is that knowledge becomes much more enriched when it can be applied in the world to make it a better place for all beings. This, too, has been an important part of your learning at Goddard. In India, i nvoking the presence of Ganesha and what he stands for –remover of obstacles, bearer of knowledge and wisdom, protector of the community – is common at the beginning of rituals, scripture reading, engaging in any contractual arrangements, and even in the breaking of ground for new buildings and other seemingly non religious events. Goddard graduates you are not at the end of your journey but at the beginning. This is Ganesha time. Take the attributes associated with Ganesha, the strength you have acquired to remove obstacles, what you have learned and apply it wisely, your sense of responsibility for others and be contributors to and caretakers of the world. 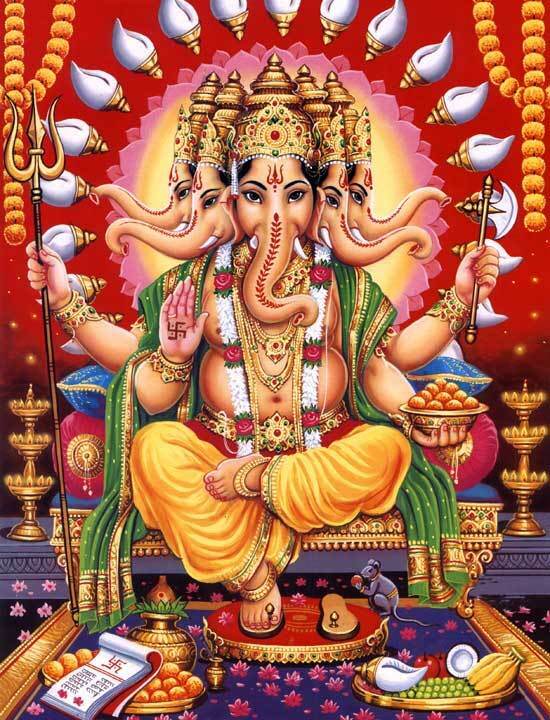 I should add that there is another attribute of Ganesha I have not mentioned: he is also the god of good luck. 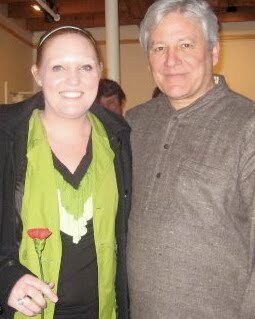 Pictures include Ganesha as statue and painting, Francis Charet with graduate Erica Pierce, and a graduation-Valentine’s Day-Chinese New Year cake to celebrate graduation. This entry was posted in Consciousness Studies/Transpersonal Psychology, Faculty, Graduation, History & Political Science, Residencies, Right Livelihood/ Making a Living, Spirituality & Religion and tagged Erica Pierce, Francis X. Charet. Bookmark the permalink. >Wonderful speech Francis. Much food for thought — what is the chief difference between knowledge on the intellectual plane, and true Wisdom? Experience (of the Sacred perhaps in Eliade's sense) is necessary no?